To put it simply, if you want a good wielding machine from a reputable and trustworthy brand with excellent value for the money, then the Everlast PowerTIG 250EX should be your choice. The Everlast PowerTIG 250EX is a versatile, high-powered TIG welding machine. It has a 250 amp AC/DC pulse TIG, and a 200 amp DC stick welder. It also boasts an efficient 60 percent duty cycle on single phase 240V, although it is possible to use three phase 240V as well. The welder can be used with almost any kind of metal, including stainless steel, copper, titanium, steel and chrome moly. ​Steel to a maximum of 1/2" single pass when using TIG. ​Steel to a maximum of 1 or more inches multi-pass when using TIG. ​A minimum of 1/16" diameter electrode when using stick. A maximum of 3/16" diameter electrode when using stick. ​​​​Starting up, It’s straightforward enough to get going, with the ‘easy start’ mechanism. This allows start up at 5 amps for either AC or DC modes. This is very useful for projects requiring the welding of thin gauge metals. At the other end of the scale, it is possible to pulse up to 500 Hz in either mode. The unit incorporates an IGBT inverter module, which is small and lightweight technology that helps performance and keeps the unit reasonably portable, at 65 pounds. It also features a spot weld timer, which is essential when making a number of identical spot welds on sheet metal. This model features weld parameters that are fully adjustable; these can be used for 2T or 4T remote operation. The high pulse frequency capability means that the overall heat input is reduced. This results in high quality welds without any burning or warping of your materials. The welder also has AC frequency and AC balance control for use in this mode. When using the stick, the arc force control helps reduce the splatter while working, and it also improves the quality and performance of the arc. On a functional level, the Everlast PowerTIG 250EX has a digital display to show you the precise amperage setting. It also has color-coded controls that are simple, easily located and straightforward to understand and use. There is a 240V receptacle which is designed to be specifically used with the Everlast PowerCool W300 water cooler. It comes with a 12-foot WP-18 series torch, which uses DINSE 35/70 style connectors. It also connects to a gas source quickly and easily, through the inbuilt gas fitting. You may wish to purchase gas lenses to improve the gas coverage of this model. Included with the unit is a bunch of additional accessories. These consist of an SMAW electrode holder, an argon regulator and a foot pedal. You will also receive a work clamp with a cable attached, a 6-foot power input cable and a starter pack of consumables. What Is the Everlast PowerTIG 250EX Best For? The product is a solid, all-around welding machine. It’s easy to use and will produce good results on a number of different welding tasks. It has a number of desirable features, including pulse settings, arc force control and a powerful high duty cycle. This is a great option for a professional welder, or a very passionate hobbyist. Users sometimes have issues when welding aluminum and thick pieces of metal, but overall it is a high performing piece of equipment. The Everlast PowerTIG 250EX is a good choice for such tasks as: industrial maintenance, prototyping, fabrication, production, and general automotive or shipping work. The Everlast PowerTIG 250EX is equipped with high and low range pulse settings. These are extremely beneficial for preventing overheating and burning while you are working. They also help to prevent your materials from buckling and losing their shape. This unit has a solid design and is built to last for many years. The controls are user friendly and functional, and they are also well laid out in color-coded sections. This makes the welder easy to use for people of all skill levels. This is a powerful machine for its price, this is especially apparent in the high duty cycle. It has a 60 percent duty cycle at the full rate of amps. It also has a rated capacity of 300 amps. The Everlast PowerTIG 250EX has a useful feature called arc force control which reduces the amount of splatter produced when the machine is in use. This results in your work being cleaner, and also preserves the condition of your workspace. The Everlast PowerTIG 250EX is a great product for most welding tasks. However, it will struggle when used on thicker pieces of metal, as it lacks the capacity to be able to complete jobs of this level. The torch that is supplied with this product will get very hot when used. A water-cooled torch is a much better option, and it comes with an in-built receptacle for a compatible accessory of this type. However, you will need to source and purchase the water cooler and torch yourself. Many users of this product had difficulty welding aluminum parts. The product has issues maintaining a stable arc in order to complete tasks like this. It also has some difficulty welding steel on a lower amperage. The Everlast PowerTIG 250EX welder is covered under the five-year Everlast welder warranty. This guarantees against malfunction, breakages or failures caused by manufacturing issues. Small accessories have a separate six-month warranty. The warranty is solely for manufacturing issues. However, if your unit is damaged from the shipping process, or a component fails within 30 days of receiving the product, you can return the unit to the manufacturer and receive a full refund. 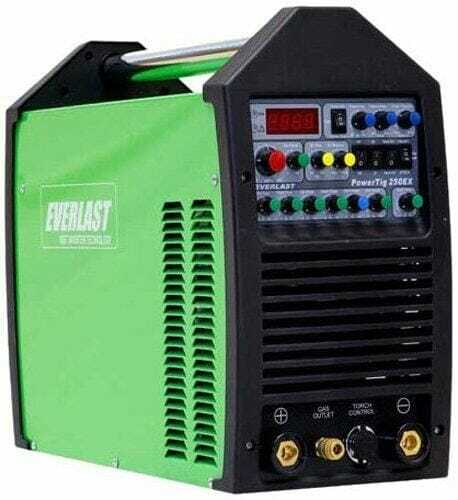 The Everlast PowerTIG 250EX is a high quality and high capability welder. It has a number of desirable features to improve your welding abilities. These include arc force control to prevent splatter and a high duty cycle for powerful performance. Pulse settings are also beneficial for preventing burning, overheating or deforming of your metals. The welder will struggle on some occasions, for example, welding aluminum or thick pieces of metal. However, it is a product that performs well overall, is built to last and it is a straightforward piece of equipment to use.